Let me introduce my "next generation" bullet journal - the junk journal bullet journal! 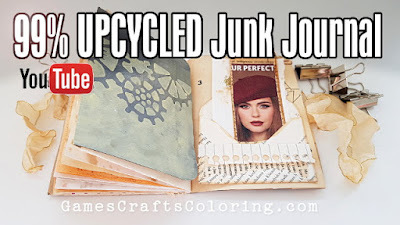 I challenged myself to use my extensive stash of junk paper and I managed to create a very nice A6 sized journal using 99% upcycled junk. 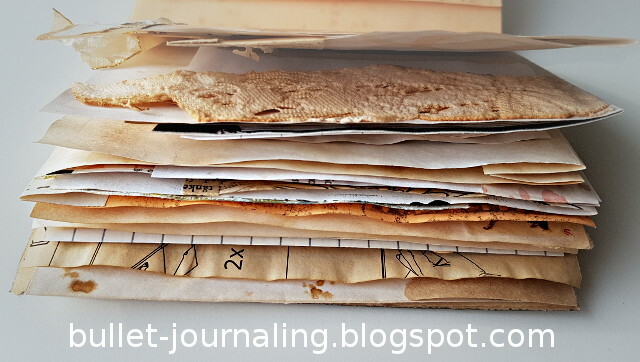 The main ingredient of my journal was my stash of used copy paper, that is to say old photocopies, old computer prints and blank pages that are wrinkled or stained for one reason or another. I also used old book pages, junk mail and assembly instructions from Ikea, just to name a few upcycled materials. I used just a little bit of washi tape as embellishment (that's not junk), but mainly I decorated the pages with cut outs from old magazines or from junk mail. I also used stamps, coffee stains and a little bit of acrylic paint. So what's the difference between my new junk journal bullet journal compared to my original bullet journal - in addition to using old copy paper as material? In my opinion, the most important difference is flexibility. My new junk journal is extremely flexible as it contains several pockets and tuck spots for holding replaceable, loose paper. 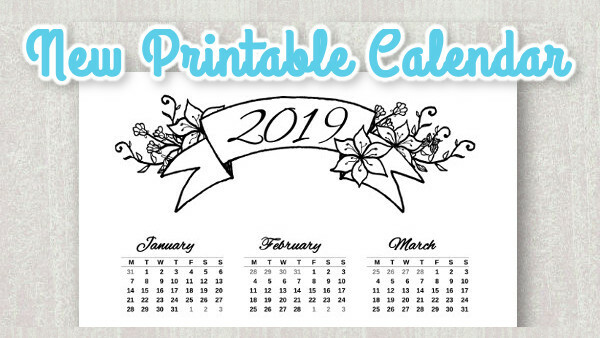 It's rather small and there aren't many pages for writing, but the main advantage of this type of journal is that you can add and replace lists and inspirational images whenever and wherever you need. Having used my first bullet journal for more than a year I now know what I need and what I don't need. In my experience there's no need to save most of my lists - to do lists, shopping lists etc. - so I'm expecting my new junk journal to be more functional and more appropriate for my needs. In terms of appearance my new junk journal is also different from my old bullet journal. I wanted it to have a grunge vintage look, so I tea or coffee dyed most of the pages and I even made a couple of yummy lace pockets to it - tea dyed of course. I made a flip through video, if you like to see how my junk journal looks and how I made the pockets and how I tea and coffee dyed the pages. 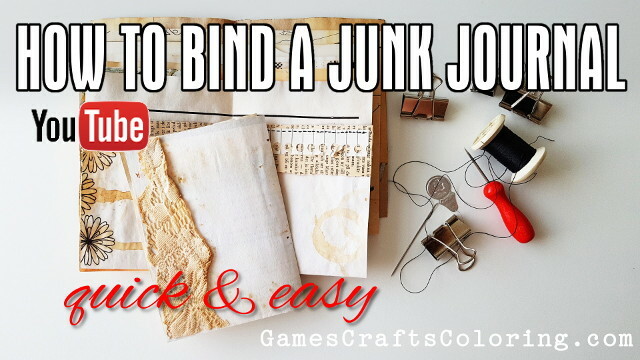 I also made another video to show a quick and easy way to bind a journal with a needle and thread. To find detailed instructions, you can visit my website gamescraftscoloring.com. Actually, I love my new junk journal so much, that I'm definitely going to make another one soon. 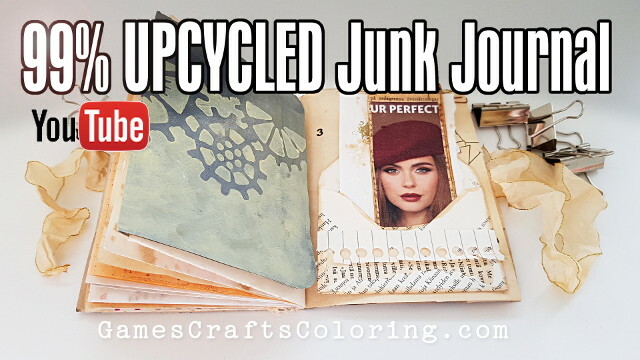 I can see a lot of use for a wide variety of junk journals for both daily use and for specific use, like a Christmas junk journal or a journal for making travel plans etc. See you on my Youtube channel!